When I was born, it fell on Father's Day. Over my 26 years of life it's fell on fathers day a few more times. This year it happened to be a few days before. Now, I know most people are wishing their Dad's a wonderful Fathers Day today but today I'm dedicating today to my grandpa. Let me explain... When I was 15 years old, my parents separated and later divorced. Over the next few years we barely communicated and rarely saw each other. And trust me, I'm using the terms barely and rarely very generously. During those years and growing up my grandpa was always there. We'd have family dinners, went on family vacations, go to church together, hang out, etc. To me he was a father figure. When I was a senior in high school, he had a stroke. Over the next few years, he never fully recovered and was later bedridden. Sadly, four years ago he passed away. I miss him more than words can describe. 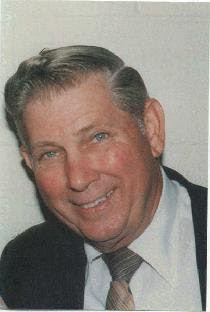 SO today, I'm wishing and missing my grandpa a Happy Father's Day! grandfathers have been on my mind today also! I love that you dedicated a post to yours! There are all kinds of Dads in the world....even grandpa Dads!!! This is a sweet tribute to him! Sounds like through all the turmoil you were blessed with a very strong loving Grandpa. Happy Fathers Day. Father's come in many shapes and forms! David's dad passed away 2 1/2 years ago. We know how it feels to loose a father. I am so glad that you had your grandfather to fill in your father's footsteps!! HUGS! What a sweet testament! Happy Father's Day to the (grand)father in your life! Sounds like such a special Grandpa you had!! I only knew one of my Grandpa's - they are so special to us girls!! =) Nice that you have such sweet memories of him!! How beautiful of you to focus on your blessings. He sounds like he was wonderful. Great post and nothing can ever replace a grandpa they always know what to do. I had something very similar happen to me - my parents divorced when I was young and my father was never around. My grandpa filled in the role, and I look to him as my "dad" as well. He passed away in 2001 before he could receive a heart transplant, and I think of him everyday.